Coaches Scott Parseghian (left) and Sean Chase (right) yell to Junior Cameron Jones at Sectionals on Saturday Feb. 9. “I mean you do it to win, you do it for the relationships you build with the kids, but when you win it just makes it that much better.” Parseghian said. The school bus barrels down Route 27 headed toward Wayland High School on a chilly Saturday afternoon. The student-athletes inside scream and sing along with the bus speakers’ rendition of “We Are the Champions” by Queen as they pass a trophy among seats and snap photos for Snapchat and Instagram. A Wayland police force cruiser flashing its lights and blaring its siren tails the bus. Wayland wrestling has clinched a state title. On Saturday, Feb. 2, the Wayland wrestling team traveled to Ashland High School to contend for the Division III dual meet state title. Wayland entered the tournament ranked seventh of nine teams and competed against Dedham, Melrose and tournament champion Foxboro. They returned with a trophy in their hands and a police detail in tow. In the first round, the No. 7 seeded Wayland matched up against No. 2 Dedham and managed to create a 40-34 team victory. Wayland benefited from great performances from sophomores Max Montes and Matt Morris and junior CJ Brown. Brown accomplished a three-pin day which helped Wayland tremendously over Dedham as well as Melrose and Foxboro. Wayland wrestling gets to add yet another trophy to its illustrious collection in the multipurpose room in the Field House. 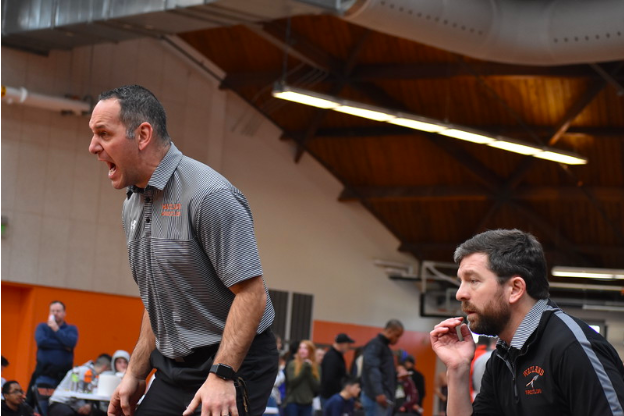 Though Wayland had won the Division III dual meet state championship, it still had the Division III central sectional tournament to host the following week. Sectionals, an event for individual wrestlers as opposed to full team competition, allowed Wayland to showcase 14 wrestlers ranging in weight and grade. Freshmen Finn O’Driscoll and Greg Deeley, sophomores Walker Whitehouse, Oliver Cerne, Tyler Gill, Will Munroe, Zach Anzivino and Matt Morris, juniors Cam Jones and CJ Brown and seniors Erik Sweeney, Michael German, Brian Carmichael and Brooks Jones all represented Wayland at sectionals. Wayland saw Cerne, Deeley, German and Morris all place second in their respective brackets, while Anzivino and Sweeney placed fourth and Brown placed sixth – all notable placements for Wayland, but not as notable as Cameron and Brooks Jones both winning their weight class brackets. Cameron and Brooks Jones’ wins at the 170 lbs. and heavyweight classes, respectively, helped guide Wayland to place third as a team in the sectional tournament and subsequently fourth at the Division III state tournament. Brooks Jones’ third-place finish at the following all-state meet (after placing first in the Divisional meet) advanced him to the New England Championship meet, where he competed against teams from all across the region in the final matches of his career. For Parseghian and the Wayland High School wrestling team, there’s more to it than just walking onto the mat and wrestling your opponent.